While most gas stations now have larger convenience stores attached, there is still a large need for the traditional gas station booths. 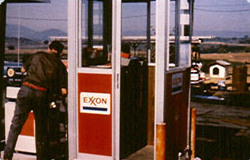 Often used for marinas, truck fueling stations and small gas stations, these booths offer a shelter for workers near the pumps. For stations that want to sell additional items, larger booths can be used as convenience areas as well.